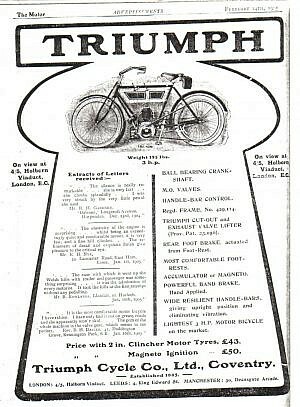 Ixion - nom-de-plume for Canon Basil Henry Davies - wrote for “The Motor Cycle” from 1903 till 1961. 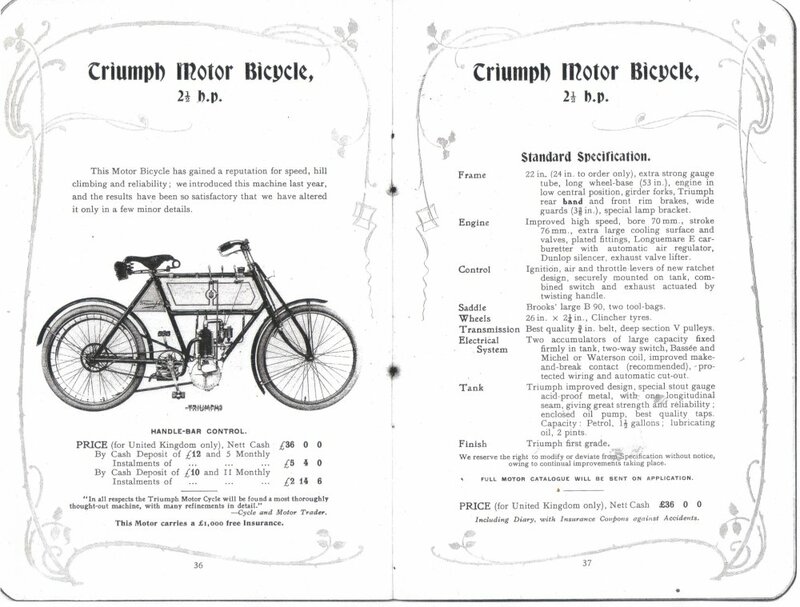 He wrote about the early days of the veteran Triumph in his 1950 book “Motor Cycle Cavalcade” ( pp. 53-55). Note the mistake he makes about the first year of Triumph’s own engine: this would lead to considerable confusing in dating ‘Trusty the first” (see 1955 VMCC Journal article). “I should personally identify two factors which saved the sport and hobby from collapse or anaemia. The first was the invention of the Simms-Bosch high-tension magneto which was standardized about 1906. The second was the energetic intervention of M. J. Schulte, managing director of the Triumph Cycle Company. 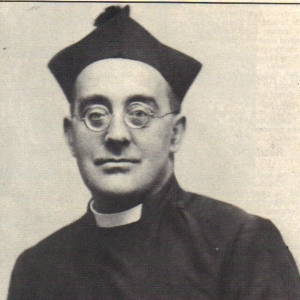 Schulte, by birth a German, was a man of great vigour, of cool and balanced judgement, and of considerable prudence. 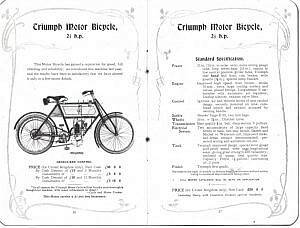 He was the first cycle-trade magnate to realize that a good motor cycle was likely to develop into the big brother of the pedal cycle, if it did not actually supersede the lighter machine. 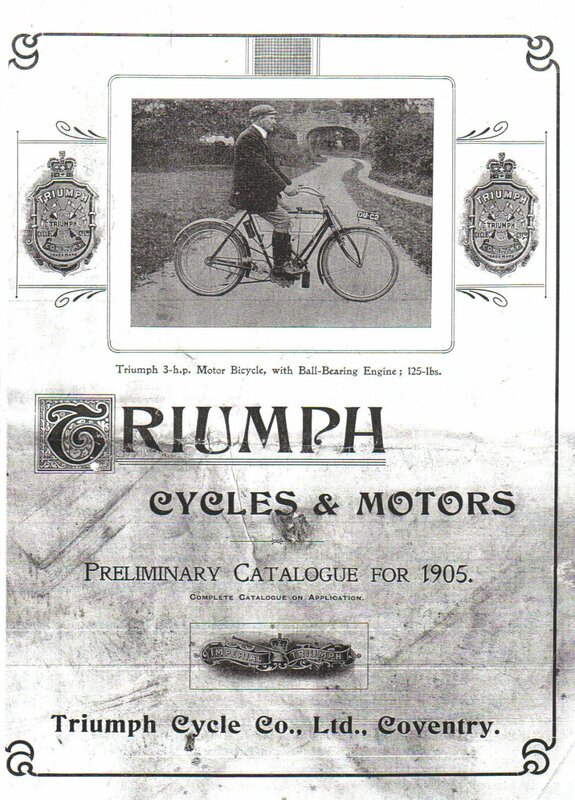 As far back as 1895 he had ridden the crude Hildebrand-Wolfmuller motor cycle on the Coventry track, and from that date onward he never failed to study and to sample every motor cycle which came his way. A conservative by instinct, he never allowed himself to be hustled by impulse into precipitate action. 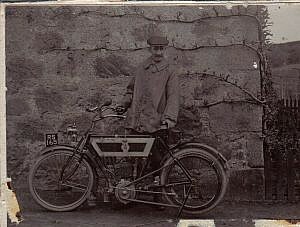 Thus he was slower than some of the big shots in the cycle trade to build experimental motor cycles. 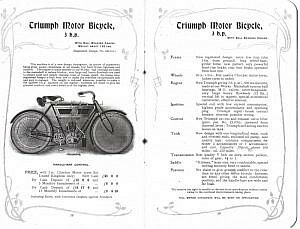 His initial experiment, about 1904, was to construct a good motor cycle with all the Triumph soundness of workmanship, and to power it with the best existing engine, the l ¾ h.p. Minerva from Belgium. There was nothing in the least shoddy about this machine, for even at this date there were considerable varieties of quality in British pedal cycles. 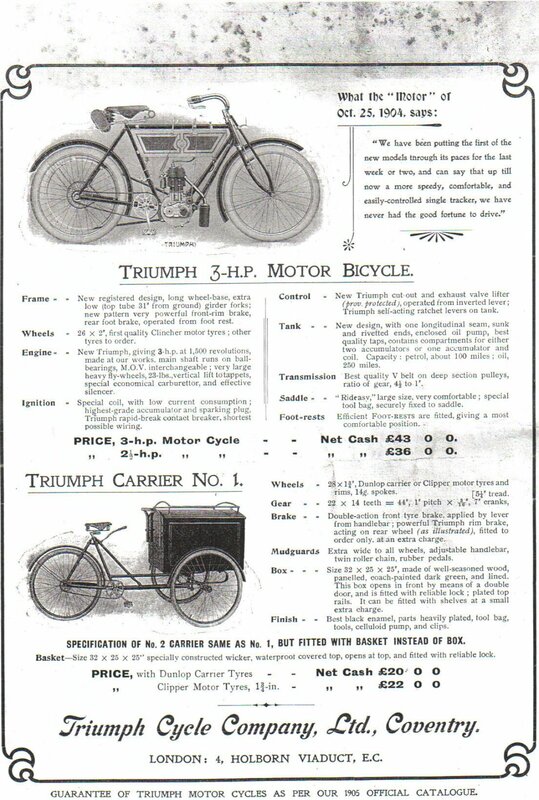 In 1906 ho went a step further, and produced a Triumph engine rated at 3 h.p.—a simple, solid, side-valve type. He was so sure of its merits that he asked me to suggest some stunt which might convince the public of its merits. Together we decided that if it could be ridden 200 miles daily for six consecutive days, it would obviously be a good buy for any citizen who desired cheap personal transport. It was, of course, single geared with a V belt drive and no clutch; therefore, it could not hope to carry my 12 stone up formidable hills. In actual fact, machines at this date were habitually geared too high. 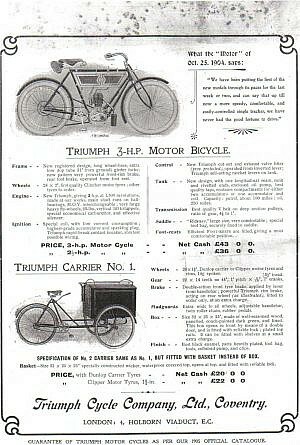 Buyers desired speed, and the standard delivery ratio was 4 ½ to 1, which made 45—50 m.p.h. a possible maximum, and provided quiet, smooth running at ordinary touring speeds of 25—35 m.p.h. So six routes radiating from Oxford were plotted, all of them avoiding formidable hills. D. K. Hall, a famous Roads Record Association timekeeper, was engaged to verify the facts, and off I started. Shocks were in store for both Schulte and myself. Late on the fifth day the machine suddenly began to feel as if it were floating on jelly. A hasty dismount showed that the duplex down tubes of the diamond frame had fractured. Moreover, the engine power had been steadily fading throughout the 1,000 miles already covered, and hasty examinations proved that the piston rings and cylinder bore had both worn unconscionably fast, while the exhaust valves were pitting almost to the scaling point. 1 do not know why Schulte had varied the standard frame, but within a few hours he had readied a second machine with the normal frame layout. Nothing could be done about the piston rings or valves. When 1 started off again on the following Monday 1 was well aware that, day by day, the vigour of the light pedalling assistance required on hills would increase in quite a sharp ratio. 1 inserted a new exhaust valve every evening, grinding it into the seat as well as conditions permitted. This time everything went well, and the 1,200 miles were reeled out with consummate ease, except so far as my calf muscles were concerned!" 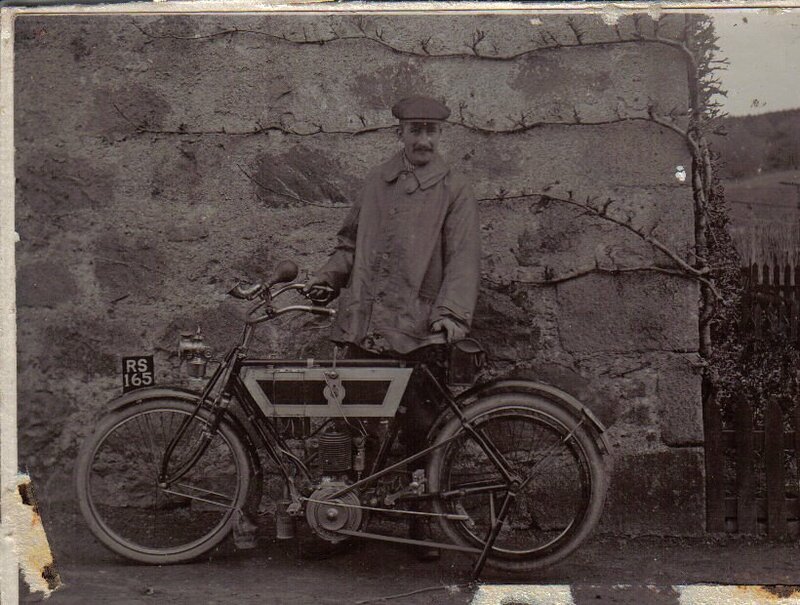 A rare early 1905 machine with Aberdeen registration. Courtesy Howard Burrows.